Rebecca Tucker is the author of the forthcoming book A Matter of Taste: A Farmers' Market Devotee’s Semi-Reluctant Argument for Inviting Scientific Innovation to the Dinner Table, from which this essay is adapted. In the television series The Good Place, which frames the concepts of heaven and hell – or, more loosely, what happens to you in the afterlife – as, well, a Good Place and a Bad Place, each resident of Earth is assigned a point score based on their deeds while they were alive. The greater the deed, in terms of its virtuosity, the higher its score; the more abhorrent the deed, the more it cuts that score down. It’s one of many concepts that the show, in its initial presentation, plays for quirkiness and laughs. But, as with the fundamental narrative of The Good Place – which is, like it or not, a deeply thoughtful, nuanced and at times devastatingly incisive criticism of human morality – there’s much more to the idea than immediately meets the eye. For one thing, the good that we, as individuals, are able to perform isn’t necessarily equal: One person’s “high-ticket items,” good-points-wise, may be entirely unavailable to another person; but how is it then fair that that person would be granted a higher moral status, simply by virtue (no pun intended) of factors beyond his or her control? In the TV series, the character Tahani – a wealthy socialite during her life on Earth – notes that some of her points were contingent on her elevated socioeconomic standing. It’s a lot easier, in other words, to get ahead, in this life and the theoretical next, if you’re already a member of the 1 per cent. Doesn’t seem particularly fair, does it? It reminds me a lot of the way we think about food. In 2018, the discourse around what we should eat is a lot like the discourse around where the characters in The Good Place should end up: Is it good, or is it bad? In the slightly literal sense, in the context of food, you might think that this means is it nutritious – is it good for me, for my body, for my health? – or the opposite: Will it harm me, physically? Our idea of what constitutes good food is just as deceptively surface-level as The Good Place; in actuality, it’s all about virtue and vice, on a slightly esoteric and often unattainable level. 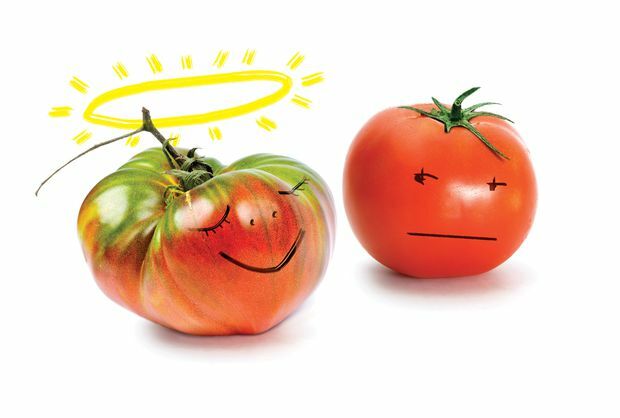 These two types of good and two types of bad – the healthful and the virtuous goods versus the unhealthy and immoral bads – aren’t mutually exclusive: Often, food that ticks off virtue is also good for our bodies. But in marketing, and in the collective consciousness, it’s become more important to emphasize morality than literal physical wholesomeness; good for you might be the baseline, but virtue is the prevailing top note. To understand this, we need to go back a few years. In 2006, the writer Michael Pollan released the defining tome of the modern foodie era: The Omnivore’s Dilemma. It sought to answer one (deceptively, beguilingly) simple question: “What should we have for dinner?” The Omnivore’s Dilemma at once defined and catapulted into the zeitgeist the food-borne anxieties that would come to frame the next decade for food activists and concerned diners. In it, the American journalist scrutinizes everything from factory farming to foraging to fast food, with the stated goal of determining the best food to eat. His conclusion, practically, is that the Perfect Meal, as he calls it, is one that is partly foraged, partly hunted and allows him “to eat in full consciousness.” Which is to say that, almost immediately, Mr. Pollan gives up the idea that the “best” food means, purely, the healthiest food. The best food, to him, is the food that allows for a pretty significant helping of righteousness. Mr. Pollan notes that the question of what to eat, for humans, has historically been almost strictly utilitarian: Evolutionarily, the omnivore’s dilemma – that is, the human’s dilemma – centred on determining first which of a plethora of foods available would not kill us, and second, deciding which of these foods could serve as good sources of the nutrients, vitamins and minerals we required to stay alive. A lot of the time, we figured this out by tasting things, and subconsciously associating biological responses with flavours: The collagen in bone broth might have once helped your body recover from a bad cold, for instance, which explains why you might crave chicken soup the next time you have a flu. (In The Dorito Effect, Mark Schatzker calls this “biological wisdom,” although he also explains that we’re not as instinctively wise to the evolutionary benefits of flavour as we used to be, on account of our prolonged exposure to the artificial stuff). Mr. Pollan addresses some of this, too. “Many anthropologists believe that the reason we evolved such big and intricate brains was precisely to help us deal with the omnivore’s dilemma,” he writes. “Omnivory offers the pleasures of variety … But the surfeit of choice brings with it a lot of stress and leads to a kind of Manichean view of food, a division of nature into The Good Things to Eat, and the Bad.” Mr. Pollan was joined in 2007 in the pursuit of revolutionizing dinnertime by Canadian writers Alisa Smith and J.B. MacKinnon, whose The 100-Mile Diet brought to the fore the very virtuous idea of “locavorism”; Barbara Kingsolver and Animal, Vegetable, Miracle followed shortly thereafter and doubled down on the assertion that the best food is the stuff that comes from your own backyard. Mr. Pollan returned in 2008 with In Defense of Food; firebrand New York Times columnist Mark Bittman released Food Matters: A Guide to Conscious Eating that year. Fast forward to 2018, when we’re stuck on the idea of food as a reflection of our conscience; of good food as moral food, as virtuous food, as food that answers the question not of “what does this food do to my body?” but, rather, “what does this food do for my soul?” Certainly, the core tenets of the sustainable food movement of today, which Mr. Pollan, Mr. Bittman et al defined in the early part of the aughts, have something to do with the health of the planet and, almost by luck, individual, physical health. But the terminology widely used by the sustainable-food movement (you know the buzzwords: “all-natural,” “organic,” “free-run,” “nose-to-tail” and all their friends and cousins) is more often meant to delineate a type of eating that is steeped more thoroughly in a sense of moral superiority than in the science of healthful eating – never mind the idea that, for food to truly be good, shouldn’t it also be easy to access? To understand one of the key reasons why this is the case, think back to Tahani, on The Good Place, and to her point score. Her social standing allowed her access to people, places and situations through which she was given the option to perform acts of extreme moral good. She could have chosen to opt out, of course, but even opting in part of the time allowed her a high moral score with precious little effort – while, for another character, the only option to increase one’s moral standing might be to hold open a door, which is worth a paltry five points. In The Good Place as in life, advanced socioeconomic status comes with the luxury of access. 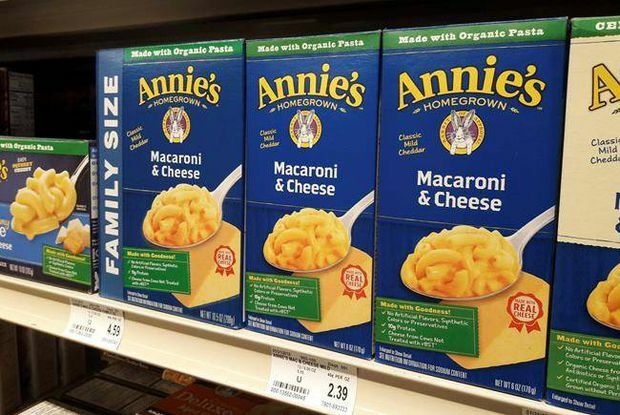 Annie's Macaroni & Cheese, shown on the shelf at a supermarket in Edina, Minn., in 2018. Kraft Dinner, at a grocery store in Quebec City in 2009. On the surface, this sort of seems like apples and, well, fancier apples. But the difference between “better” food and “organic” food is significant. For one thing, “better” – which we’ll take here to mean healthy, or healthier – is subjective, and up for debate: One person’s healthy might be another person’s sodium-rich. But organic is a set-in-stone concept, enforced at a federal level in the United States and Canada, and defended fiercely by its disciples as the best option for you, your family and your planet. You can evangelize for Annie’s, because you can evangelize for organics. And many do. It’s much more difficult to evangelize for “better food,” even though that’s what we all really want, because those terms aren’t as concrete. Annie’s has the advantage of a clearly defined side. But Kraft has the advantage of price. A box of KD sets you back $1.47 at Walmart, and Annie’s Organic Mac and Cheese costs about a dollar more. So it’s not entirely clear whether, in this particular example – and many others – the organic option is the better option for everyone, every time. Not everybunny can stretch their grocery budget, but everybody deserves better food. In researching her 2014 doctoral thesis, Ms. Hodgins looked not only at the high price margins of alternative food-market spaces, such as farmers markets, but she also conducted intensive interviews with the proprietors of such spaces – vendors, and farmers themselves – to get a sense of what they believe to be barriers to access. The responses were too varied to list here. Among them was convenience: Specialty stores and farmers markets are open infrequently, keep odd hours and are often simply not easy to get to for low-income individuals. The convenience factor, respondents said, also applied to the time it takes to cook food: One of Ms. Hodgins’s interviewees remarked that one can “feed a family from scratch for three days, if you wanna do it” (emphasis his). The idea here, as Ms. Hodgins notes, is the inaccurate assumption that shopping and cooking habits are always typically framed as a matter of choosing to purchase fresh, organic foods over packaged ones, or to prepare one’s own food from scratch instead of eating out. It’s an especially egregious way of thinking when applied to low-income households, an extension of the age-old idea that if poor people would simply pull up their socks, work a bit harder and maybe read a book or two, they’d be happier, healthier and richer. Shaming the poor accomplishes nothing, and the aforementioned idea – rooted as it is in a bourgeois definition of financially anchored moral fortitude – is as wrong now as it ever was: A 2017 study by the University of Toronto think-tank PROOF found that individuals living in food-insecure households reported the same cooking abilities and menu-planning habits as those in higher income brackets. Desire for the organic peach is universal; access to the organic peach is not. And that’s because, it almost goes without saying, the organic peach – the farmers-market peach – is just way, way pricier than its conventional counterpart. Last summer, I passed up an $8 basket of juicy freestone peaches, on sale at a farmers market located in one of Toronto’s wealthiest neighbourhoods, for a $3.99 basket onsale at a convenience store nearby. I don’t know if the half-price peaches were organic, or hand-picked, or how large the farm on which they were grown actually is; I didn’t hand my cash directly to their farmer or one of his or her friends, but a part-time retail clerk. But, even on a decent income with few bills and no dependants, I can’t always justify the moral superiority that comes with forking out almost 10 bucks on stone fruit. And anyway, it’s no coincidence that in Toronto, where I live, most farmers markets are situated in wealthier enclaves, or near plenty of tourist and white-collar foot traffic: Farmers need to make money, after all. So they need to market to people who’ve got it. Peaches await cleaning and packing after being picked at an orchard in Beamsville, Ont. The lower-price fruits and vegetables available from chain grocery stores and big-box retailers are often the products of a highly subsidized industrial agricultural system that perpetrates (and perpetuates) serious environmental and social ills. But they are fruits and vegetables all the same. And simply suggesting that individual consumers choose to spend more money on food – whether to invest in better farming practices, to demonstrate using economic means that there ought to be a greater level of funding toward alternative food-retail infrastructure, or both – assumes that such a choice exists. “[Alternative food markets] are sometimes touted as the silver bullet,” Ms. Hodgins says. “But they’re not. In fact, it’s not a better food system than the conventional food system if it’s excluding people.” Put another way: If a food system is not accessible, how can it possibly be sustainable? So what good does it do, to inflict the idea of a moral good – and therefore, the attendant idea that opting out of the moral good ought to result in a sense of personal shame – on a way of living, shopping and eating that is literally out of reach? A lot of the time, the language we use around good food borrows terminology (and, indeed, sentiment) from religion: It’s no coincidence that one of the most widely shared articles responding to the recent lawsuit against hipster seltzer company LaCroix, which claims the company overinflated its use of the term “natural,” was written by Alan Levinovitz, an assistant professor of religious study at James Madison University in Virginia. In fact, Prof. Levinovitz writes often on the injection of morality into specific types of food, and why this impulse is entirely useless – if not potentially harmful.